Tired of leftover mashed potatoes? 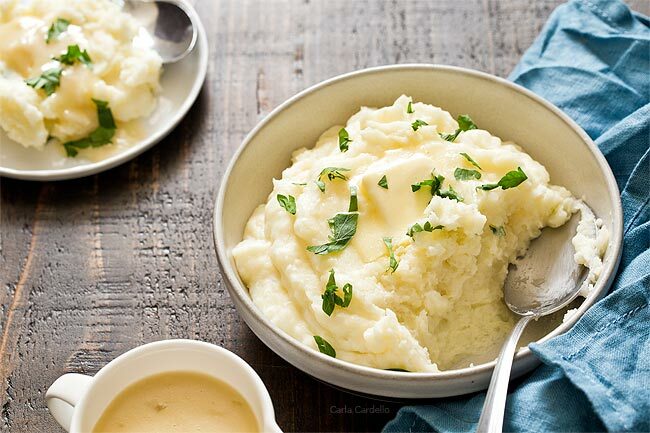 Learn how to scale them down with creamy Garlic Mashed Potatoes For Two plus several tips and tricks on how to make the best mashed potatoes without being gummy. One problem I often hear about when cooking for two – how do you make mashed potatoes for two people? Either you make too much or not enough. Luckily for you, I figured out the correct proportion of ingredients. Today I’m focusing on my traditional Garlic Mashed Potatoes For Two. If you’re looking for something a little more adventurous, I also have recipes for Cheddar Pumpkin Mashed Potatoes and Broccoli and Cheese Mashed Potatoes. It’s hard to portray in the photos how many servings this recipe makes (I mean, one large bowl does look like one serving), but it makes about 4 servings. However, if you’re making this for Thanksgiving, you can stretch out the servings since it’s being served with other food. This recipe is from 2008. I’m updating this post in 2019. That means I’ve been making this recipe for about 11 years now. Talk about tried and true! That means I have A LOT to say about making successful mashed potatoes. Some of you have been complaining my posts are too long, but truth is there is a lot of info to share. I wish I could condense it down, but sometimes it is what it is. If it’s too much to read (maybe you need to make mashed potatoes RIGHT NOW for dinner), you can scroll straight to the bottom for the recipe. I can’t include all of my tips in the recipe card; hence the long post. But I will try my best! 1. Add garlic for an extra flavor boost. 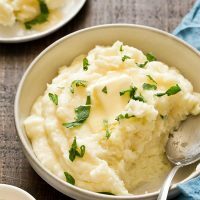 My secret to making the best mashed potatoes? Adding whole garlic cloves to the cubed potatoes. They soften alongside the potatoes so when it comes time to mash, they blend in with the potatoes. I recommend adding 3 large cloves, but I’m also Italian and love garlic. Boiling them also removes that raw garlic taste, so the flavor is mellower. Of course if you’re serving garlic haters and/or can’t eat garlic, you can leave them out. You’ll still have deliciously fluffy potatoes without them. 2. Add your potatoes to your pot before bringing to a boil. One question I often get from my parents at what feels like every Thanksgiving – do you add the potatoes to the pot before or after the water comes to a boil? The reason you add potatoes to your pot then fill with cold water and bring to a boil rather than adding potatoes to boiling water is to evenly cook the potatoes. If you add potatoes to boiling water, the outside will overcook while the inside won’t cook enough. You want both the water and the potatoes to come to temperature at the same time. Add your potatoes to your pot, cover with cold water, then bring to a boil. Don’t forget to salt your water! The potatoes will absorb the salt as they cook, resulting in not bland potatoes. I usually add about a handful of kosher salt. 3. Once boiling, turn your heat down to a simmer. Once you bring your water to a boil, turn the heat down to a simmer. Rolling boiling water will move the potatoes around too fast, resulting in disintegrated potatoes. Simmering means the water won’t move as fast but still be hot enough to cook them through. 4. Drain and let your potatoes dry. Once drained, let your potatoes air dry for about 5 minutes. If you transfer them straight to the bowl for mashing, you’ll end up with watery mashed potatoes. 5. Mash by hand or your lowest setting on your mixer. 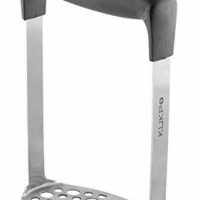 For the fluffiest mashed potatoes, mash using a potato ricer or a hand masher. However, I’m lazy and will often use my stand mixer on the lowest setting. If you go this route, you need to be gentle and not overmash. Overmashing will result in gluey and gummy mashed potatoes. I turn the mixer on in spurts. Let it mash for 30 seconds, turn off, add the ingredients, turn back on for 30 seconds, turn off, check, repeat as necessary. You should still get creamy mashed potatoes, but sometimes I’ll leave it on the slightly chunky side in order to not accidentally overmash. 6. Use room temperature milk and butter. The temperature of your ingredients matters when making mashed potatoes. 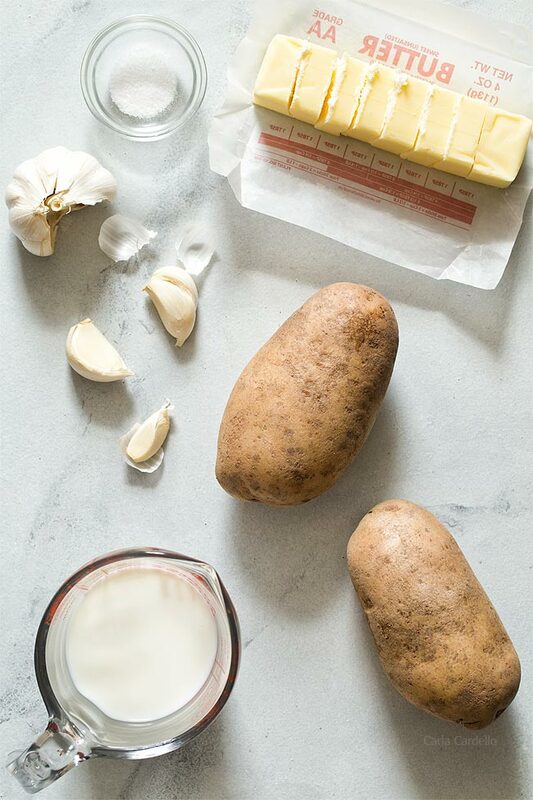 Using cold milk and butter will bring the temperature of the potatoes down, resulting in cold mashed potatoes. Make sure your milk and butter are at room temperature. If you accidentally added too much milk, don’t fret! To thicken mashed potatoes, put them in a dry pot and cook over low heat until they start to dry out, stirring often so they don’t burn. 7. Keep your mashed potatoes warm. 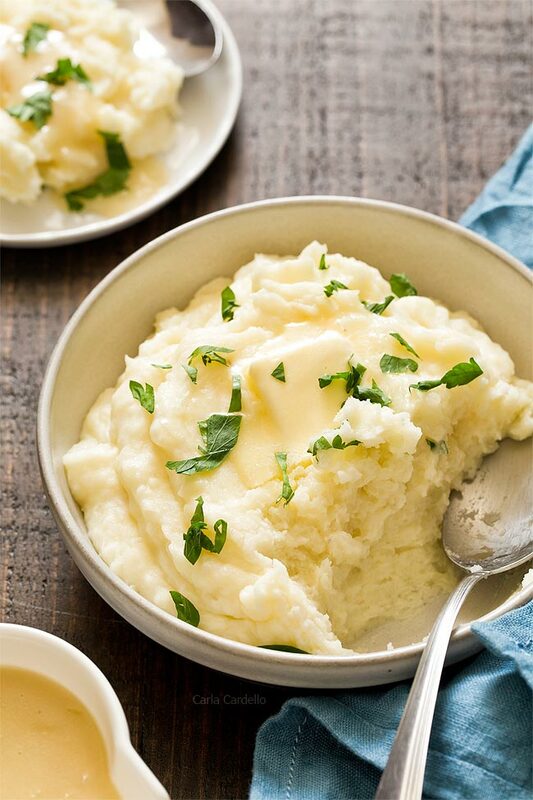 Mashed potatoes are synonymous with Thanksgiving. However, the one problem I have when making such a large dinner is keeping them warm while working on other dishes. 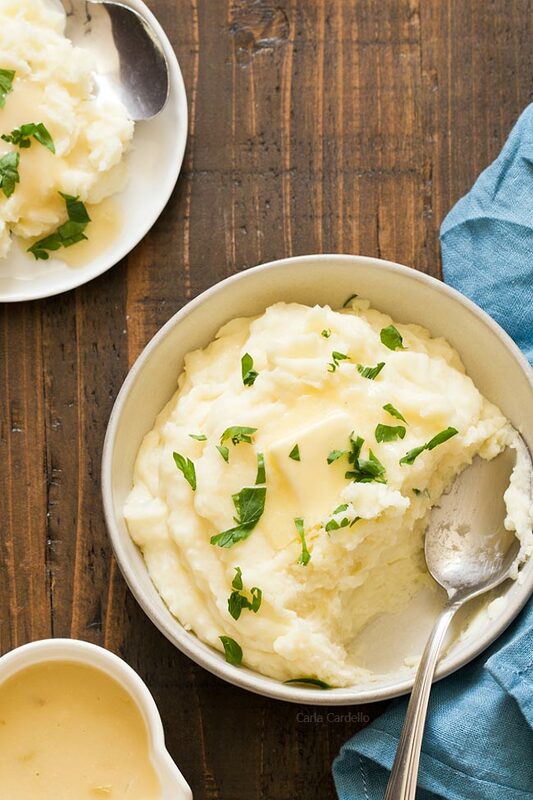 Luckily there are several ways to keep mashed potatoes warm until you’re ready to serve. If you only need to keep them warm for 15-20 minutes, usually a dish towel covering the bowl keeps in enough heat. However, if you need to keep them warm longer, say an hour or so, set the (heatproof) bowl of mashed potatoes over a pot of simmering water (like a makeshift double boiler), cover it with a dish towel, and stir every 15 minutes or so. When you’re ready to eat – voila! 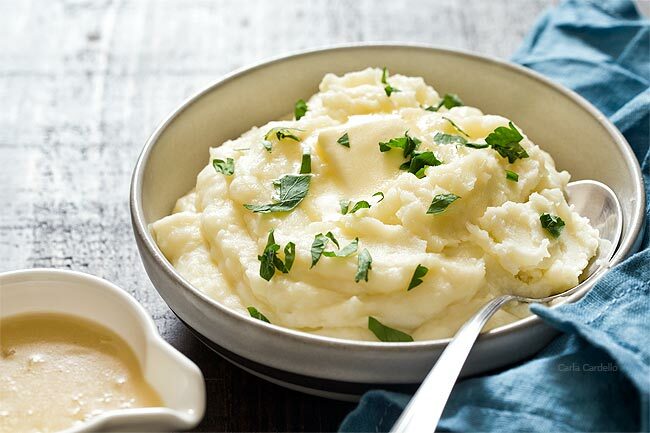 Warm mashed potatoes. Now that you made mashed potatoes, what do you serve with it? Quick Sausage Ragu by Foxes Love Lemons – I cut the sausage filling in half then use my own mashed potato recipe. Tired of leftover mashed potatoes? Learn how to scale them down with creamy Garlic Mashed Potatoes For Two! Add the potatoes, garlic, and a handful of salt to a large pot and cover with water. Bring to a boil. Transfer the potatoes and garlic to a large mixing bowl. 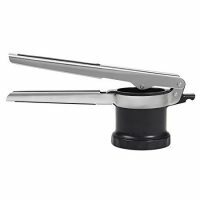 Mash by hand with a ricer or masher or beat on the lowest speed possible with a mixer. Add the butter, milk, parsley, and salt. Mash/beat until melted and smooth. Taste and adjust for salt. If you accidentally add too much milk, put them in a dry pot and cook over low heat until they start to dry out and thicken, stirring often so they don't burn. Thanks so much for this! I’m living abroad and attempted to make a Thanksgiving dinner. Sadly, gravy is non-existent here, so I needed some potatoes that would stand alone. These were perfect! Love this! My husband is currently out of town and I have been having issues trying to scale back my meals to just the three of us (my kids are young so cooking for two has worked well). These mashed potatoes look wonderful. Let me know what you think if you make this! So glad I found this recipe! 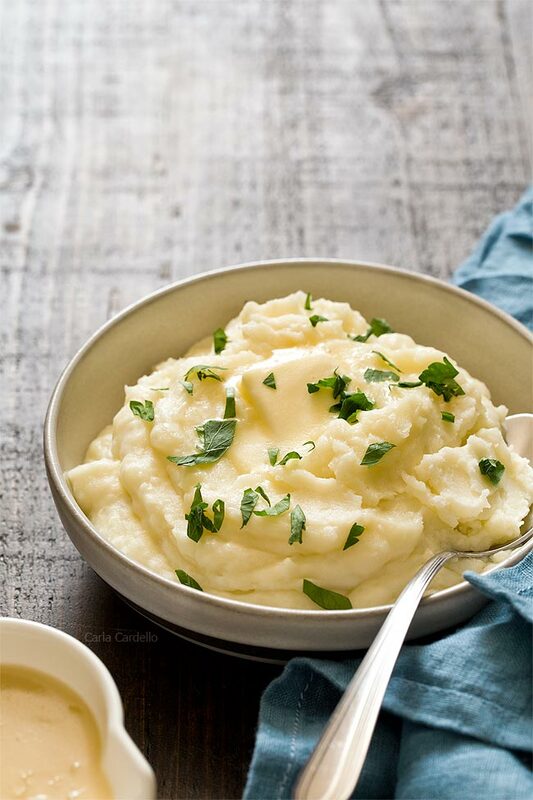 I always end up with leftover mashed potatoes, but this recipe makes the perfect amount! As much as I love mashed potatoes, leftovers aren’t as good the next day. Let me know if you try it! I just bought a ricer. I cannot believe how creamy and fluffy potatoes are with a ricer! My hubs will love this. He orders garlic mashed potatoes all the time.